The statement posed in the title comes from Vash the Stampede who asked Nicholas D. Wolfwood. 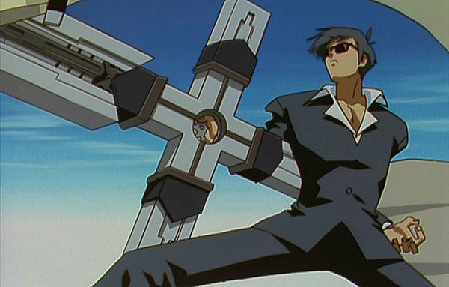 Wolfwood carried around a large crossed shaped gun called The Punisher as can be seen above. These characters I mention come from the Anime and Manga Trigun by Yasuhiro Nightow. The lead character of the story is Vash the Stampede but the other main character that we watched for was Wolfwood. His story is different in the manga but I will be concentrating on his story from the anime. Wolfood had a troubled past growing up. He felt the only way to escape from the trouble of his guardians was to shoot and kill them. He later finds himself in an orphanage where he goes from patron to protector. His goal is to take care of the children so they don’t have to experience the same abuse that he had to endure when he was younger. He is taken in by Chapel the Evergreen who raised him to be the future successor of the Gung-Ho Guns Gang and bestowed upon him the Punisher.